Last night was a change in shooting scenery (I’d like to remind you that I use this term in relation to video cameras, not guns). 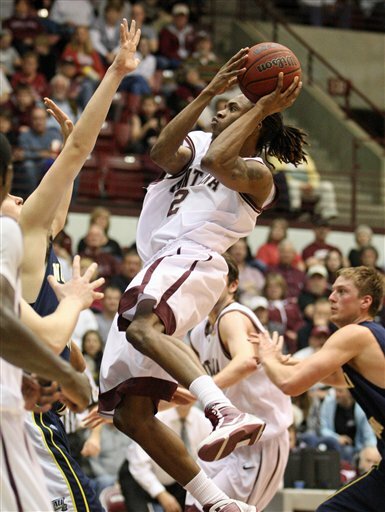 I had the opportunity to film the Montana Grizzlies Big Sky Tournament quarterfinal game against Northern Arizona. First off, it was such a nice change in athleticism, as it’s much easier to shoot higher levels of basketball because the game is played much more fluid. The play develops properly and thus it’s easier to follow the action within it. Secondly, it was a pleasant change to be able to shoot the entirety of a game and not just pieces of it. It’s easier to tell the story of a game with just a short highlight sequence when you’re able to see the whole game. Thirdly, it was the largest magnitude of a basketball game I’ve shot as it was collegiate playoff action. Finally, it was great because for the third time this season we kicked the crap out of NAU, winning 81-60. The game was well in hand the whole way as Montana took an early double digit lead and never looked back. Although Anthony Johnson was by-far the most prolific scorer in the game, registering 22 points on 8 of 12 shooting, the team was firing on all cylinders. Freshman guard Will Cherry was just one board shy of a double-double with 11 points and 9 rebounds. Raason Young hit double digits as well, dropping in 11 points after shooting 5-8 from the field. Editing the highlights for the Griz games is always way more enjoyable. A) Because there are always way more plays worthy of making the highlight sequence than in high school ball and B) because I get a full minute of highlights to show, making the process less restricting and allowing me to get in nearly every bucket I deem important and/or thrilling. Following the victory, the Griz will face off against Northern Colorado on Tuesday, March 9th, in a Big Sky Tournament semifinal game.